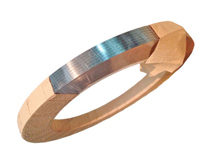 We offer Bimetal Strips (Copper Clad Aluminium) to our valuable clients. we are manufacture, exporter as well as supplier of Bimetal Strips (Copper Clad Aluminium). We hold expertise in providing an extensive range of Bimetal Strips. we provide sizes as per your requirment with best delivery.